My name is Anand and I joined CloudShare 4 months ago as the product manager. This is an exciting time to be at CloudShare with a lot happening on the product front. I spent most of my career in the enterprise space mostly in development and testing. In my spare time, I enjoy hiking and exploring in and around the bay area, California. My first blog is going to be on the release that comes out this Sunday, code-named “Quartet”. Our friendly RnD give names to our releases. We went through mountains, quirky names and now it is music records. This is probably the place you spend most of the time when working with CloudShare. We have a few exciting features for you. Single view and collaboration – in some cases you are working on your own and need access to the machine. In other cases, you want to collaborate with others in your team. Similar to having a WebEx or GoToMeeting (we love both solutions btw) you want to invite your colleague to view your machine. It could be to discuss a bug, a feature or a demo. I am pleased to announce that we now support console access for multiple concurrent user sessions over RDP thus allowing a single VM to be shared with multiple users at the same time. This has value to users in that it offers flexibility in accessing the VM either using RDP which offers “single user session” or the Console which offers “Concurrent user session”. New machine navigation – remember the days when you got each machine in a separate window or tab? You can still do that, BUT, now you can view all the machines in a single page. No need to browse back to the ‘Environment’ page to select another VM to view. No need to remember which tab each machine is in, or open too many tabs. 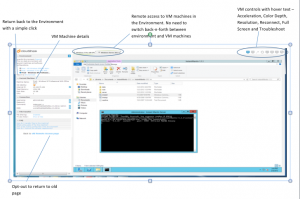 We released a new RDP page that allows users to switch between the VMs in an environment without leaving the RDP screen. The new RDP page will be the default connectivity option for CloudShare ProPlus environments. If you need more details, we posted an intro doc on our support site. I heard from several customers that they need the ability to copy an individual VM from an existing environment to a new environment. The reasons for this are several-fold. One use case is that they consider a specific VM in their reference environment as a corporate standard and want to use the same VM in another environment. Another use case is that the user spent a considerable amount of time configuring and customizing a VM in their environment and now, would like to copy it over to another environment where they can make minor modifications to the copied VM and re-use it for fast setup thus preserving their existing investments in configuring and customizing. While we always supported the ability to snapshot and clone a complete environment (which could be your reference implementation), I am pleased to announce that we now support the Copy VM functionality allowing users the flexibility and freedom to reuse their IP by copying over an individual VM from one environment to another with a few simple clicks. While this new feature should address most of your needs, there is one limitation which we will address in a future release. We don’t allow copying a VM to the same environment i.e. the copy VM is supported across environments but not within the same environment. 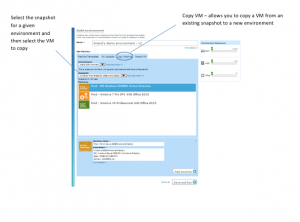 We hope you will find the new copy VM functionality useful and easy to use. This feature facilitates collaboration in the team and is available to our Enterprise customers. In the below, I can select and copy a VM machine from an existing reference environment “Anand’s Environment” to a new environment “Anand’s demo environment – v2” that I am creating. And yes, you can now remotely access the VM machines and the services running on them in your environment using the machine name instead of using the IP address. The users that typically ask for this are those that work with remote desktop connection managers or terminal services such as MSTSC. The new persistent DNS feature allows them to switch between servers quickly from a central location. This is also useful when users may need to use the dual monitor feature that is offered when connecting with these types of tools. The new CloudShare persistent DNS feature now maintains a VMs external name (FQDN) for the lifetime of the environment. Previously a VM would receive a temporary name which would change if the environment was suspended and then resumed. Note, while the FQDN will remain the same, the IP address will change as the environment is suspended/resumed. The VM machines have to be running for you to access them. 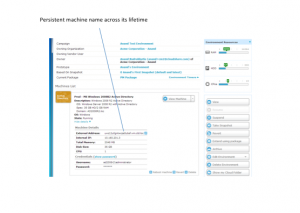 Users can query DNS to find out whether the environment is suspended before accessing the VM machine. You can use SSH or other remote access protocols to access the VM machine using the VM machine name. This feature is available to our Enterprise customers. This just about covers what I have to say for now. Our RnD team has other interesting goodies they are working on which I think you will find very interesting and useful. I will be back soon with more to share. Until then, Happy Trails!